I have chosen to image the bubble around the Wolf-Rayet star, WR23 at the north end of the Carina Nebula using three narrowband filters to bring out structural detail. 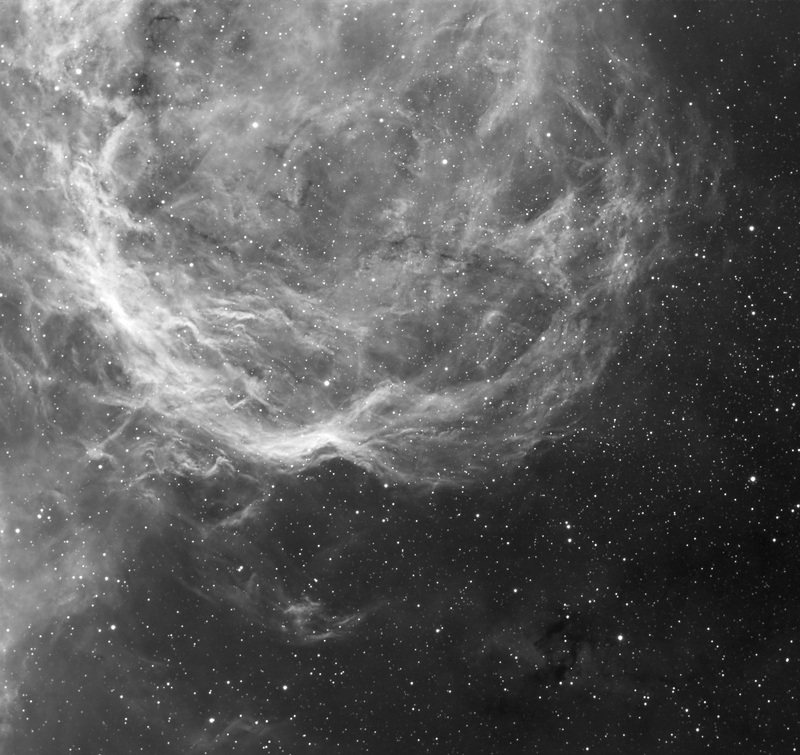 This nebulosity apparently does not have a catalog designation (e.g., RCW, Gum, Trumpler), so I will refer to it as the bubble around WR23. 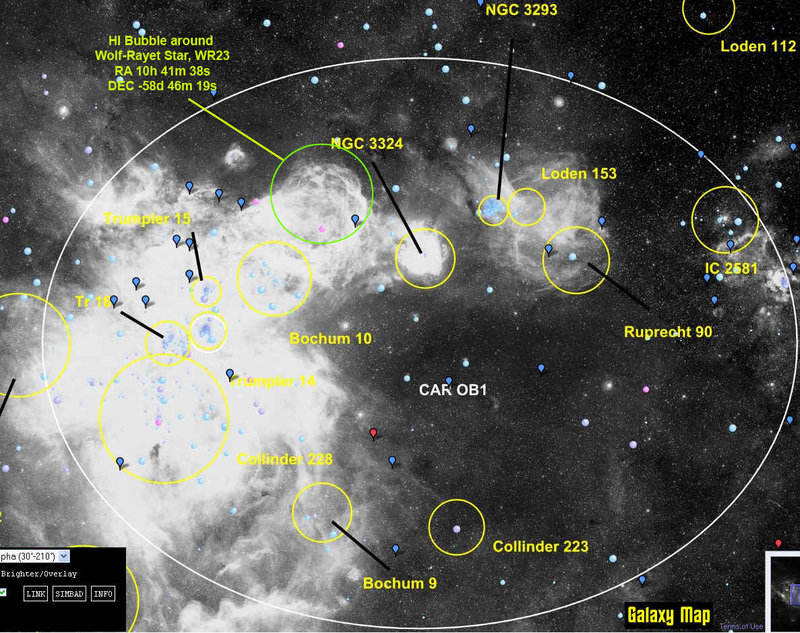 Its location can be seen in the Galaxy Map image shown below within the green circle. 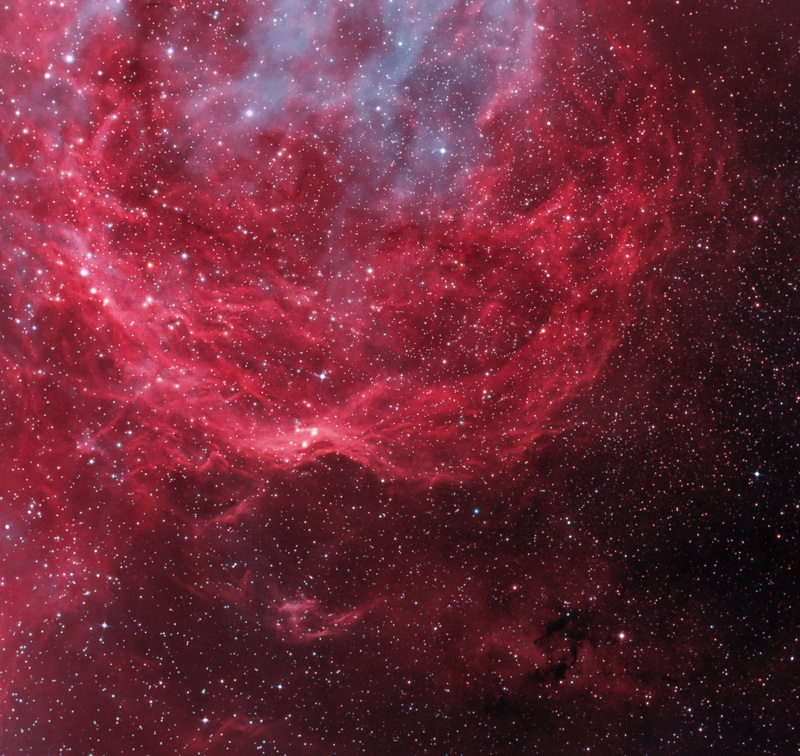 The Gem Cluster (NGC3324) and NGC3324 (Gabriel Mistral Nebula) are nearby. WR23 (HD92809) is located at RA 10hr 41m 38s and DEC -58d 46m 19s. It is the middle of the three bright stars near the top of the narrowband image just to the left of center in a pocket of blue-mapped OIII nebulosity. . The Hubble mapped color palette was used where Blue = OIII, Green = H-a and Red = SII. The framing was chosen to create the appearance of looking through a hole into the Carina nebula toward Eta Carina. 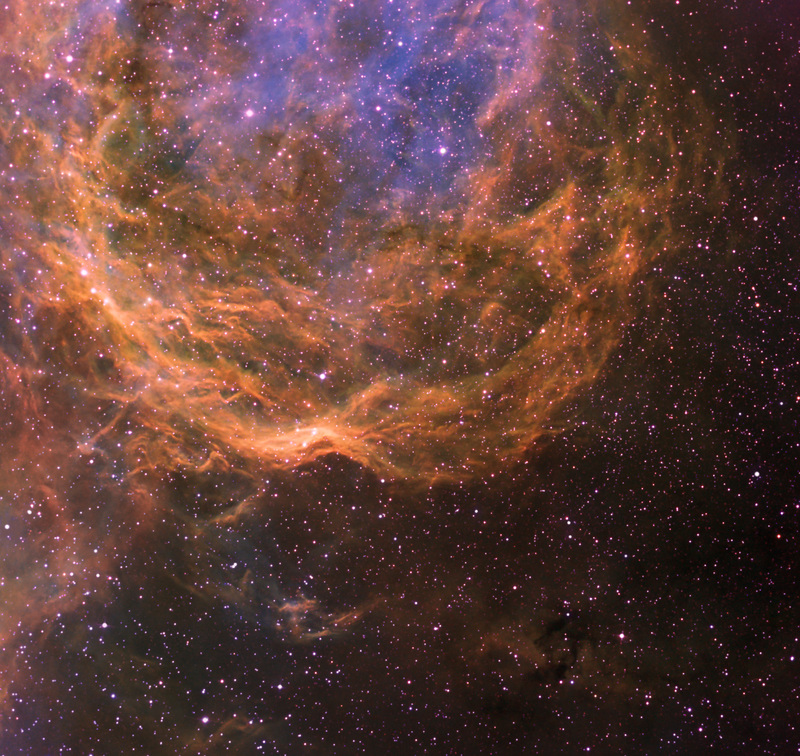 Wolf-Rayet stars are hot (25,000 – 50,000K) , massive (>20 solar masses) stars. They are undergoing a normal evolution for very massive stars where they lose orders of magnitude more solar mass each year in comparison to our Sun. They do so in the form of a very strong solar wind that interacts with the interstellar medium, often producing "bubbles", as shown here. Thor’s Helmet (NGC 2359) is a northern example of such a WR "bubble". C. Cappa, et al.(Astron. & Astrophys, v426, Issue 1, June 2, 2005, p 155) estimate the age to be 700,000 years and a size of thebubble to be about 42 light years in radius, expanding at 10 km/s. The H-a data used to make the color composite is presented below. For those who prefer natural colors, the colors were remapped so that Red/Magenta = SII and H-a and Green ~ Blue = OIII.